Probably a bit over an hour to Ripon on the A59 from Preston. Pass round the north of Harrogate. Embsay Railway near Skipton on A59 about 2/3 of the way there. A church was first located here in 672 AD by St Wilfred. Only a small part beneath the cathedral remains. A fine very strong looking building. 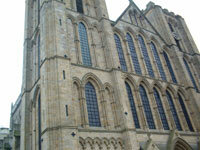 As with all cathedrals an appeal for funds for roof restoration is underway. There was a Christmas Fair, nicely done, in the Cathedral on the Saturday we visited. 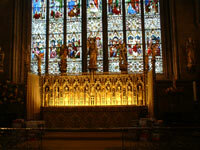 The dullness and cold outside and candle lit interior of the choir made it appear very Christmaslike. Stained glass window in the cathedral. Ripon market square in November 2003. Ripley village. The castle is behind us and the church. The castle has regular guided tours and is open almost every day. 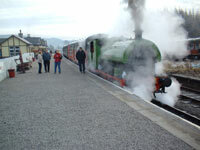 Embsay and Bolton Abbey Railway. On A59 near Skipton. This is a Santa Special and runs every 40minutes in the Christmas period.